Kevin Czinger says he wants to completely change how cars are built, but his motivation isn’t money or fame. It's to help humanity avoid the "suicidal direction that people are heading," he declares. By shaking up how cars are made, Czinger believes, the world will be saved from an impending climate disaster. And that’s where 3D printing comes in. Yes, that’s right: Some day, most cars will be manufactured using 3D printing technology, if Czinger gets his way. But first, an aside, because you’re probably thinking, Well, how about ‘saving the world’ with something we’ve already got: electric cars? The correct response there is, Not so fast. Yes, drivers switching wholesale to electric vehicles would certainly make a sizable dent in the CO2 damage that tailpipe exhaust creates. Yet those cars are just a Band-Aid solution, since the electricity they require comes largely from nonrenewable sources. So picture a Band-Aid trying to cover a gaping environmental wound. Alternately, the most effective way to reduce the environmental damage cars have long fomented is something people don’t usually think about: automobile manufacturing. According to a United Nations report, manufacturing is the single largest source of the damage automobiles unleash on the environment. An electric vehicle's batteries account for about a third of its weight, while the carbon composites and aluminum in its body also require a lot of energy as part of its production and processing. And while low-emission vehicles can be good for the overall environment in places in the United States where green energy providers already abound -- think California -- electric cars simply add to the problem in places where coal still rules -- think China. Because coal, as we well know, is a global-warming bomb. The part of the Blade that's 3D printed is the chassis, not the entire vehicle. 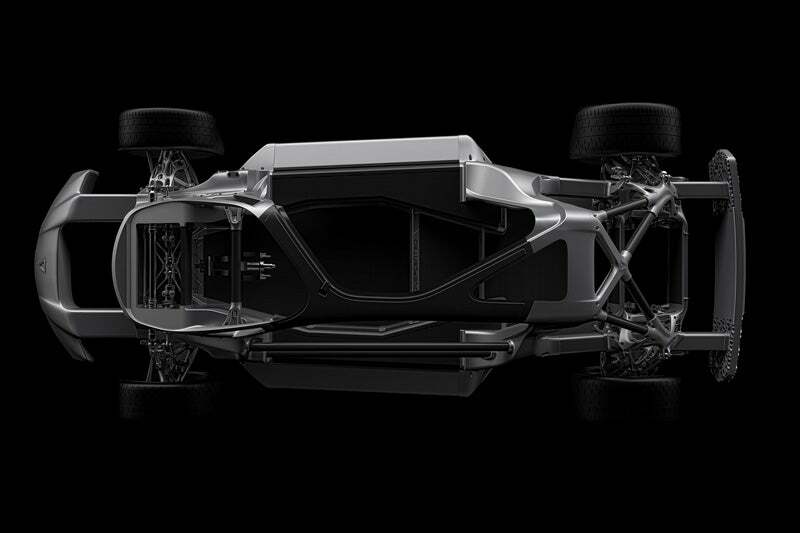 The company says a chassis such as this can be assembled in a matter of minutes. "The [reduction of] tailpipe exhaust," Czinger says, “is fooling you into thinking that you're not creating a super-destructive system, that any potential environmental benefits are offset." That’s a mistake, he says. “You're vastly accelerating the destruction of the environment." So, how does this Los Angeles-based entrepreneur, who walked away from his first startup, plan to shake the pollution out of how the automobile industry builds cars? His answer brings us right back to 3D printing. 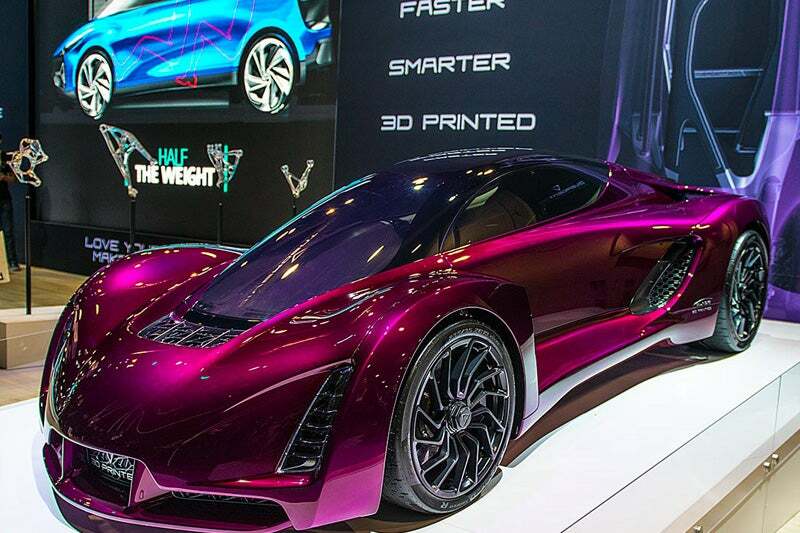 Czinger’s company, Divergent 3D, created and holds the patents for 3D-printing equipment and software that specifically allows carmakers to print individual pieces of a vehicle, each of which is then assembled by hand or machine. The process requires less energy and fewer materials than current manufacturing methods, Czinger explains, by replacing the hard-metal tooling, stamping, welding and painting currently required to create today’s vehicles. In a case study, Divergent found that its process eliminates 80 percent of factory costs and decreases the number of chassis structure parts by about 75 percent compared to typical vehicle-manufacturing practices. "The machine doesn't care if you're doing the most complicated layer cake in the world or you're doing a simple nail," Czinger says. "We're looking at it as a system we're going to continuously innovate around, and then we're going to license that, so that people can create structures that are much more functional and much more profitable and use vastly less material and energy." Czinger says he sees Qualcomm, which licenses the use of the chips found in devices such as smartphones, as a model for Divergent. His own company, which emerged from stealth three years after its 2011 founding, employs about 55 people, most of them engineers. And so far, it’s raised a total of about $28 million. Last year, Divergent also announced a partnership with PSA, the French automobile giant. 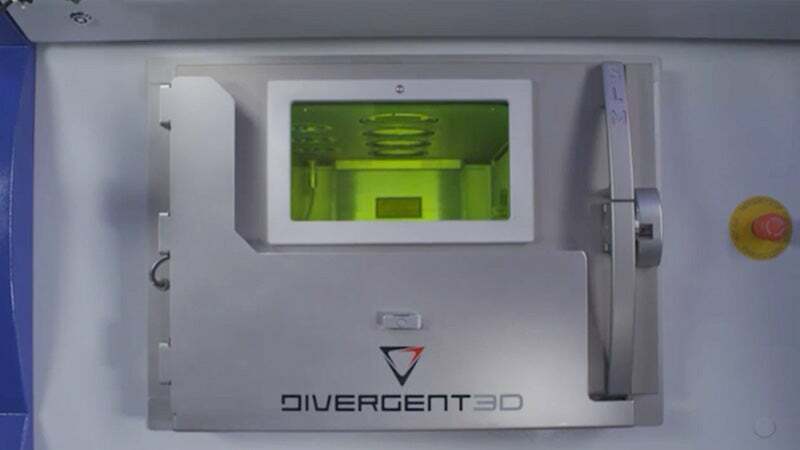 PSA weighed in on the deal: "We are very impressed by the promising new opportunities in Divergent 3D's technology. We're convinced that these spectacular advances in 3D printing will help position PSA Group as a leader in automobile manufacturing," said Carlos Tavares, chairman of the managing board of PSA Group, in a press release in March. 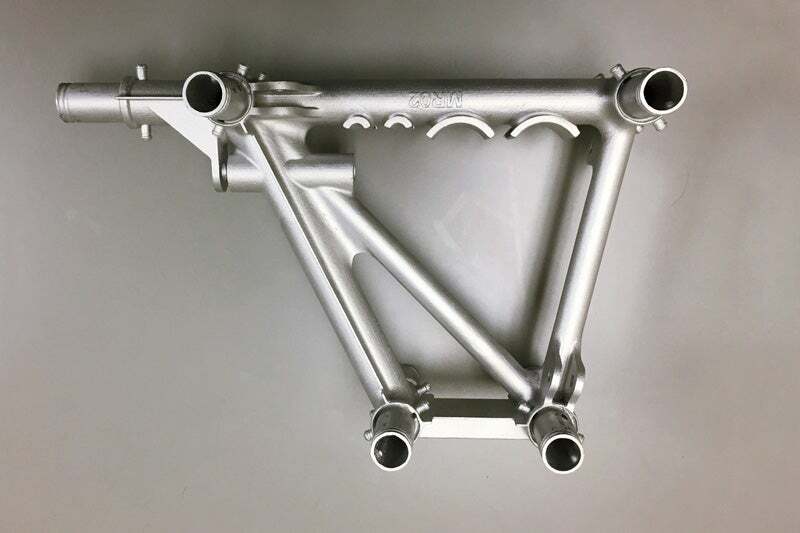 Divergent 3D creates car parts using metal 3D printing that bypasses some of the most energy-intensive factory operations such as fixturing, stamping, welding and e-coating. Czinger plans for Divergent to partner with major automakers and commercialize the technology, which he believes could eventually lead to what he calls a democratization of cars. In that scenario, individual designers and small firms would create car models, and customers would special-order them. The larger automakers could act as the manufacturer, certifier and distributor, combined, for smaller brands. "Design, engineer, send data, manufacture, assemble the standard parts and customized Lego block connectors and then you have an object," Czinger says, ticking off the steps of Divergent's process. "That will be for a whole range of complex structures: vehicles, maybe in the future architecture, aerospace vehicles, etc. “You've democratized even the larger-scale industries because there's no big capital barrier to them anymore, and you've relocalized the manufacturing. That's what I think the future will be." Czinger's past goes back to Cleveland, where he grew up, and where he had a love of cars ingrained into him from a young age. In high school, when this son of a housewife and door-to-door salesman was captain of the football and wrestling teams, Czinger also developed his other passion: a love of nature and a sense -- instilled by his Jesuit teachers -- that we are all responsible for the planet. "They were totally focused on stewardship," he remembers. "That you had 100 percent responsibility for creating a human society and for caring for nature." Following graduation, Czinger attended Yale, where he played football under Carm Cozza, who coached the team from 1965 to 1996. Cozza gushed over Czinger in his 1999 book, True Blue, writing, "Kevin Czinger was the toughest kid to play football at Yale in my 32 years as head coach. Divergent 3D partners with SLM Solutions Group to develop specific metal 3D printing hardware and software. “No question about it," Cozza’s memoir continued. "He was also the most unusual personality, probably the outstanding overachiever, maybe the brightest student, and definitely the scariest individual." Scary? "When I say Kevin was tough,” Cozza wrote, “ I mean he was competitive to the point of obsession, and loyal almost to a fault." Czinger earned his BA from Yale, followed by a law degree from Yale Law School in 1987. “You have to understand context and be willing to discipline yourself for a greater aim." That greater aim included interning with Goldman Sachs during law school, clerking for Judge Gerhard Gersell -- who famously presided over the Watergate and Iran-Contra cases -- then moving to a job as an assistant attorney in the U.S. Attorney’s office, Southern District of New York, under Rudy Giuliani, who of course would later become the city's mayor. Relatively early in his tenure, the then-young attorney Czinger even led a case. He then made a return to Goldman Sachs, where he became the executive director of media, telecom and technology group, from 1991 to 1995. "Those things transformed me from someone who had zero public speaking skills -- I was shy and nervous -- into someone who could stand up, think on their feet in a logical way and address a broad range of people," he says of those early years. In 2008, Czinger finally acted on his love of automobiles by moving away from both law and Wall Street to become co-founder of CODA Automotive, a company which produced electric vehicles. His experience at CODA ultimately led to the founding of Divergent 3D, but first, Czinger had to fail. CODA aimed to create electric vehicles for the Chinese market by converting an existing Chinese sedan to electric power, but Czinger found that the associated economic details were not in the company's favor. "If you look at electric cars, autonomous vehicles -- all of these programs people are talking about -- these are all lower-volume vehicle programs," he points out. He says he wanted the company to change course, but because he had raised so much funding and given away equity, his share of the company had become minimal. So, in 2011, Czinger left CODA to start researching the concepts that would eventually become Divergent 3D. While researching his next move, Czinger found studies, primarily the aforementioned UN report, that detailed the environmental impact of automobile manufacturing. He also found inspiration in Stephen Emmott’s book, Ten Billion, which predicts a global calamity once the world population reaches 10 billion. "By 2025 we'll have 8 billion people in an industrialized world that's scaling up," Czinger says, ominously. "We're going to look [back] at that 120-year period where we built 2 billion vehicles, and in the next 30 to 35 years we're going to build 4 billion-plus vehicles, which on average are 50 percent heavier. “So, we're going to, in a fraction of the time, triple the number of vehicles ever manufactured in the history of the planet." He continues: "From a materials and energy standpoint, you're looking at a magnitude difference in environmental destruction. That means that the way we design and manufacture vehicles is critical to our survival." This fact reflects the sobering reality that electric vehicles can be as detrimental to the environment as gas-powered ones -- and Czinger isn’t the only one saying that: Ozzie Zehner, author of Green Illusions, declared that, "Moving from petroleum-fueled vehicles to electric cars begins to look more and more like shifting from one brand of cigarettes to another." Czinger says that once he started looking into the problem, he knew that an incremental solution wouldn’t be good enough. There needed to be a way to eliminate the specific machine tooling and long assembly lines currently used to manufacture vehicles, he reasoned. That solution? 3D printing. Divergent showed off its 3D-printed car, the Blade, at CES 2017. "The dream of car engineering is to look end to end at a vehicle and only pick the materials that are perfectly optimized for each segment," he says. "That's what [3D printing] allows you to do." Divergent got PSA on board after it shaved about 150 kilograms off a Peugeot 308 and reduced its number of structural parts by more than 75 percent. Not only that, Czinger says, but the updated version of the car won a better crash rating. During our interview, Czinger tends to give lengthy answers involving technical descriptions. He even expresses gratitude to the Carnegie Library System in Cleveland, where he spent weekends as a kid reading for entire afternoons -- his favorite pastime growing up. Clearly, he’s a lifelong learner. And, today, he says, when tasked to learn something new, he takes a similar approach to those library days of his youth: reading and more reading. "The reality is you can teach yourself anything," Czinger says. "First, I do a general survey of what the literature is, to understand what people are thinking; and then if I find particular people that I want to talk to, I'll talk to them." Still, while all that idealistic stuff about fighting climate change is Divergent’s mission, Czinger has his feet planted firmly on planet Earth. He knows Divergent is a business first. "The most internal discipline you can possibly have, because you are wanting to change the world, you have to look out and say, 'I'm not going to change anything if I run out of money,'" Czinger says. "I'm not going to change anything if I don't survive. I have to make sure that we maintain our survival." Meanwhile, he says he doesn’t see Divergent as an extension of himself. "My ego doesn't depend on this company,” he says. “Whether my life is successful or not doesn't depend on this company. I'm going to give it, like, an enormous, crazy, crazy, crazy effort because I'm a competitive person and I think this is the right thing to do. But, as a human being, this is not about ‘me.’ The most important thing is to be a good person and have those relationships." He adds, "If I thought this was about making more money or being cool, I would not do it for a second, believe me."